Hunting Season is Near, Do You Have a Game Fence? HomeArticlesHunting Season is Near, Do You Have a Game Fence? Hunting season is right around the corner–the animals are out! 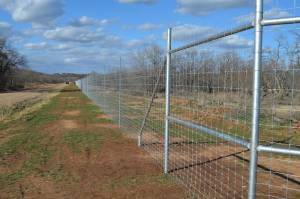 Game ranch fencing helps create a virtual barrier for wandering wildlife or livestock. Whether your goal is to keep animals within your property or keep predators from entering, investing in game fencing is the cost-effective way to confine. Before installing a game fence, dictate the main purpose of the fence, consider your land’s topography, recognize any regulations on game fencing that may be in your area, and plan ways your new game fence can be placed to do its job without majorly disrupting the surrounding wildlife habitats. An important factor within game fence design is visibility. To avoid fence destruction or unplanned animal injury, high game fencing helps wildlife negotiate fences and retain boundaries–maintaining a peaceful coexistence between man and animal. Just like most other types of fences, the height of the fence and the spacing of the wires are primary considerations when planning the design of a game fence. It is important to decipher what animals are desired to keep in, and the ones that must be kept out–all to determine a necessary height and acceptable style. Texas Fence & Iron Co. provides our clients with game ranch fencing expertise for the ultimate product solution on the market. We offer a wide range of game fencing height and style options made with the highest quality materials–installed by our dedicated professionals. Our team can create, construct, and install strong and impact resistant game ranch fencing that meets your specific needs–without detracting from the landscape. If you’re in need of game ranch fencing this hunting season, Texas Fence & Iron Co. has got you covered. Call us today to learn more about game ranch fencing and the variety of options we offer.